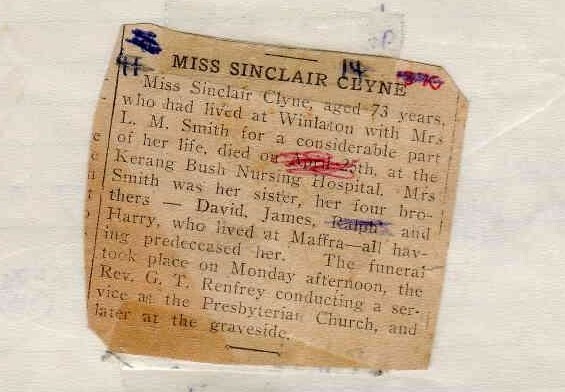 The second document in my family history file is the obituary for Sinclair Clyne. As with the obituary I featured last week, this obituary was also in the collection of newspaper clippings and photos that my ex-husband “rescued” when his mum was going to throw them out. The clipping also didn’t identify the newspaper that this clipping was taken from. It wasn’t until I was able to find the death entry for Sinclair on the Death Indexes for Victoria and her entry in the Kerang Cemetery indexes, that I was able to find her burial date. I was then able to search the microfilm on the newspapers at the State Library of Victoria to identify the date and name of the newspaper it was from. This obituary appeared in the Kerang New Times on Friday, 30 April 1943. This clipping shows Sinclair was 73 years old in 1943, which indicates she was born in 1870. The birth indexes show that Sinclair was born in 1869 (registration no 20992) at Burrumbeet. The obituary shows she died 25 April 1943, and the Kerang Cemetery index shows she was buried 26 April 1943. Sinclair never married. The obituary shows she lived for many years with her sister, Mrs. L. M. Smith, at Winlaton. The obituary I featured last week was for Thomas Smith of Winlaton, and his wife was Louisa May Clyne. Sinclair and Louisa were sisters. Thomas Smith and Louisa May Clyne’s eldest child was Dorothea Isabella Sinclair Smith. She was my ex-husband’s grandmother.